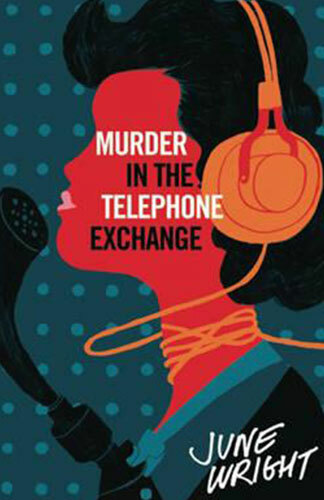 Out of the many, many books on Carmel’s table one day, the title “Murder at the Telephone Exchange” grabbed my attention. As a closet lover of ‘closed’ mysteries it sounded like my kind of book, even more so as I’ve recently begun to feel the need of a tiny break from all the forensic/cop/PI based novels that seem to now dominate the crime fiction genre and have me double checking all the doors at night. As soon as I got my grubby paws onto the book and read the back, I was excited to discover that June Wright was actually an Australian female mystery novelist and not only was she writing during one of my favourite eras – to top it all off, the novel was also set in Melbourne. But I must admit I pretty shocked that I had never heard the name June Wright before! Murder at the Telephone Exchangewas published as a result of a writing competition entry in 1948. Interestingly, one article I read while researching June, stated that the judges of the writing competition didn’t feel any of the entries were good enough to win the prize money but thought a couple of entries were good enough to publish – including June’s. Luckily for modern readers, June’s first novel was republished in April 2014 by Verse Chorus Press. Maggie Byrne is the heroine of the story, a country girl with a flippant attitude experiencing independent life in the big city while living in a boarding house and working at the titular telephone exchange. Maggie and a friend discover a murdered colleague in the ladies cloakroom – one universally loathed by her fellow workers creating a vast range of potential suspects. Maggie isn’t terribly sorry her colleague has been killed (especially after a rather creepy interlude) and sees the murder as an exciting challenge, one she is determined to solve as she has grave fears the plodding police (her view – not mine) just aren’t up to the challenge. The novel is witty and quickly paced with strong, vibrant descriptions of Maggie’s 1940s Melbourne and I also enjoyed getting a real-time glimpse into the young working women’s fashion and style of the day. The side characters were all believable who interact as well rounded individuals and not just as foils to Maggie. I grew particularly fond of Maggie’s mother – she would have made a fantastic main protagonist in her own right and I felt the storyline really benefitted by her arrival in Melbourne. Aside from interruptions by work and sleep, I rarely put this book down. However, the book itself was let down by continual typos and mistakes in the editing. Too often my enjoyment of the flow of the novel was halted by a “he” instead of “she” or words either missing letters or misspelled etc. It started to make me wonder if the original had just been scanned into a computer and was never read by a human before being republished. The mistakes weren’t on every page but they were frequent enough to make me start keeping a list – which I then forced myself to stop doing as it was beginning to ruin my ability to immerse myself in the plot as I began proofreading instead. That aside, I am now a fan of June Wright and can’t wait to get hold of more of her books as Verse Chorus Press have committed to publishing her remaining works over the next few years.